One of half a dozen adults on the bus, Damous Hailey, said the players from 10 Orange Mound Youth Association football teams had been playing in all-star squads. 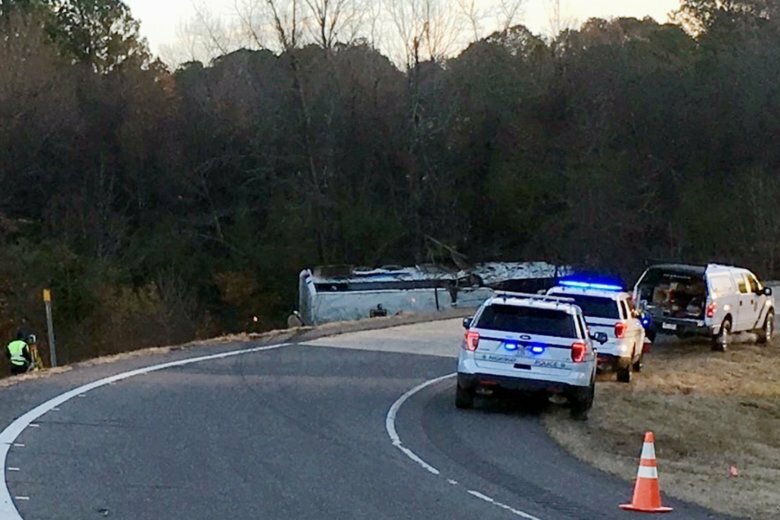 He told The Commercial Appeal newspaper that the bus swerved then flipped “about 15 or 20 times,” before landing on its side at the foot of an embankment. At a news conference in Memphis Monday afternoon, Nickalous Manning, area superintendent of Aspire Public Schools, said a third grader from an Aspire charter school died in the crash. He did not reveal the child’s name. Authorities haven’t talked about the cause of the crash that happened under the cloak of darkness. The bus driver told state police that she lost control. The heavily damaged bus came to a rest after tumbling down a steep embankment next to the crook of a sharp bend on an off-ramp. Dr. Todd Maxson, surgeon in chief and trauma medical director at Arkansas Children’s Hospital in Little Rock, said 22 of the 26 children aged 9 to 13 who were admitted to the facility were released by late Monday afternoon. He said the four remaining children were stable and expected to fully recover from their injuries. The University of Arkansas for Medical Sciences received one adult patient who has not been discharged. A hospital spokeswoman said she couldn’t provide any details, citing privacy laws. It is unclear if seat belts were provided. Lawmakers in Tennessee tried but failed to introduce regulations in 2017 requiring seat belts in new school buses. The bus in Monday’s crash was a charter bus. “It helps keep kids out of trouble,” said Morgan, who also played on traveling football squads in his youth. It “gives kids opportunity and brings the community together,” he said. Associated Press reporters Adrian Sainz in Memphis, Tennessee, and Rebecca Reynolds Yonker in Louisville, Kentucky, and Hannah Grabenstein in Little Rock contributed to this report.